The current St Agatha’s Church is located close to Market Way and replaced a much simpler mission church. The current church although from the outside looks like a plain brick building has a unique inside. 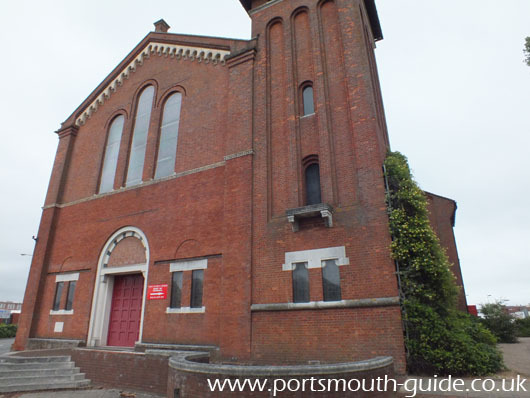 The outside of the church was designed to fit into a row of terraced houses and surviving WorldWard II bombing is now located alongside an arterial road into Portsmouth. The current church was designed by architect Joseph Henry Ball who having studied Romanesque churches in Lombardy then implemented many of the features he had seen in this church. Fr Dolling wanted an open plan church where people could see the alter. Bell provided a spacious "Early Christian" style basilica. Although limited on space outside the interior offered endless opportunities for mural and mosaic decoration. The building work was carried out by W R Light and Sons and cost £7,000. The nave of four bays which are 124 feet long and 43 feet wide were covered with a wooden roof of Queen Post construction. The tower was built to half its intended height and provided a baptistery. On 27th October 1895 the new church was opened by the bishop of Southwell, but the parish was virtually destroyed on 23rd December 1940 during a bombing raid although the church survived. After the war the Anglican diocese abandoned the church to its fate and closed it in the same year that Fr Coles left. A year later it was stripped and the church was compulsorily purchased for use as a naval store. A floor was inserted just below the capitals and the whole building was divided into storage pens. In 1964 demolition was prevented as work for a road begun. 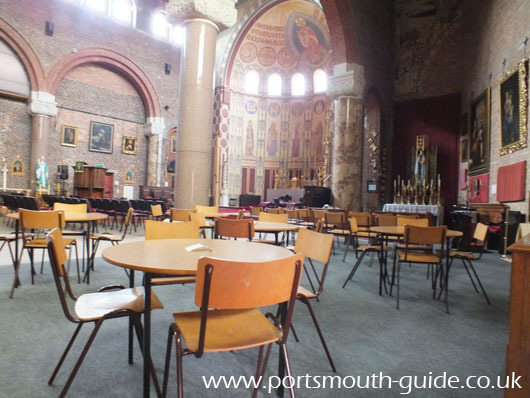 The building was listed as Grade II status in 1969 and the restoration of the church soon began. In 1994 it was opened to the public again.